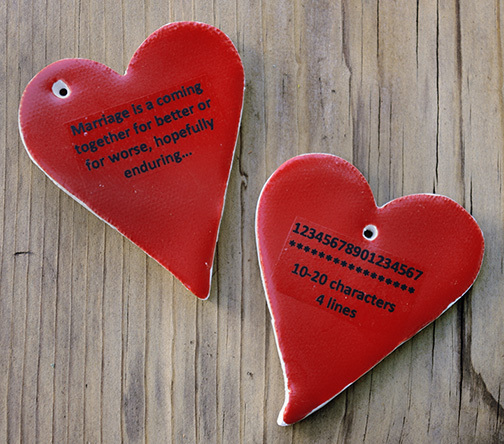 We had a request about making custom hearts, so we worked out the details and would like to share them with everyone. We are using a vintage cookie cutter to cut out these hearts so we can assure a uniform size that will fit the decals. The hearts are just under 3″ tall. The text area is about 1.5″ wide and can accommodate 4 lines of text. As you can see above, between 10 and 20 characters can fit in a line, depending on if you are using a wide letter like capital M or a narrow letter like lowercase i. You can order hearts with a custom message for $3 each (plus shipping if necessary). As always, the funds we raise selling hearts and other art will help keep this project going. Contact us at loveisaradicalact (at) gmail (dot) com to discuss details. As always, we have our regular hearts for sale and would love to see them pop up all over the place. Thanks!